Many small business owners worry that their lack of technical expertise will hold back their company app. It is indeed possible, however, to create popular, useful apps even if you’re not a tech company. Now, the companies below are admittedly huge brands with access to big budgets. Their apps undoubtedly were built with the help of technically savvy partner developers. However, with TapTap Direct, you also have access to a technically savvy partner developer! Therefore, let these apps inspire your imagination when it comes to what is possible for non-tech companies when it comes to apps. ESPN is a digital media giant. They’re big enough, in fact, to drown in their own size when it comes delivering content on the little screen. Their app is perfectly balanced, however, to leverage the huge amount of information they have with the small amount of information users want when using a mobile app. Using the ScoreCenter app, users can select a sport or game, and get a quick update on what’s going on by reviewing scores and headlines. The takeaway for small businesses: Whatever your business has to offer, focus with pinpoint accuracy on the most quickly-accessible functions when you design your app so that users can get what they’re after with a minimum of hassle. What’s the first thing you would expect the Amex app to do? If you guessed, “Tell me my balance,” you were right. But the app is quite powerful and versatile aside from that, providing users with special offers, reward redemptions, informational content, and even receipt management. 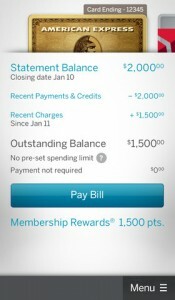 The Amex app gives users what they want, then expands into a great suite of related features. The takeaway for small businesses: Focus on a core function, then branch out once you’ve nailed it to deliver extra value in ways that make the most sense for your users. Nope, it’s not for ordering. It does something even better – meal customization! If you’re health-conscious or dealing with dietary restrictions, the RR app will let you customize a meal so you get exactly what you need. The takeaway for small businesses: Personalization is a user-favorite. If your app has customizable functions, that’s a big plus. It’s a match made in heaven. The number one user request for Zipcar was almost certainly, “Where is the nearest car?” The app delivers exactly that, along with a bunch of other useful and neat functions (you can remotely honk the horn!). TapTap Direct specializes in mobile solutions for businesses to communicate to their customers. Take your marketing mobile and watch your sales grow!